SHUNGITE— SMALL. 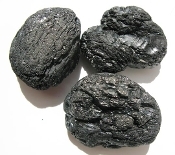 Approximately 1 1/4" - 1 1/2", by 3/4"- 1 1/4" Shungite formally known as Carbon Black) is an amorphous variety of graphite of intense black color. Its a natural composite with a homogenous distribution of crystalline silicate particles in a carbon matrix. Fullerenes (a unique class of carbon-based molecules whose discovery led to the awarding of a Nobel Prize in 1996) have been discovered in this mineral. On the Mohs scale of harness, SHUNGITE rates as fairly soft, falling between 3.5 and 4, it should be handles with care (Quartz family is 7.5 hardness).